Have you read the newspaper only to get the feeling that the very article that you are reading is already published all over the Internet for a long time? Those articles are probably taken from article directories from the Internet, and yet it is a viable source for information on any niche! If you want to drive tons of traffic to your website using a free or low cost way, then article directory submissions are the to go! 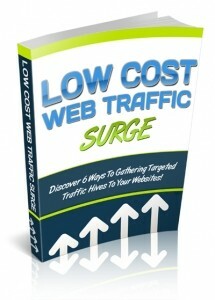 Famous article directories have LOTS of targeted traffic. Thousands of people go to article directories to source for content (e.g. for your local newspaper). Similar to high traffic blogs, article directories also allow you to brand yourself as an expert. Some article directories rank high on the search engines – it allows your author bio to rank high on the SERP (search engine result page) and it even passes the PR (page rank) juice to your websites. Write an article about product or something related to your website. (If you can?t write, don?t worry… you can pay someone as low as $5 to get a quality article written for you). Once your article is complete, do a search on Google for the search term – “article directory”. You will find a list of article directories. Choose one of them and register as an author or an article writer and contribute your article to the directory. It might take a few days or even a week to get an article approved, so make sure you are patient enough to wait. Once your article is approved, it will remain on the „front page? of that particular niche for a couple of days before it is „pushed down? by newer article submissions. One of the advantages of article directory submissions is that you can take the same article and author bio and re-use them over and over again. What you can do is to „cut-and-paste? the article and post the article to a list of article directories (when in doubt – use Google). Occasionally, you may find the process too tedious; you can outsource it to someone else for a low price of $27-37 dollars to submit that article for you to a few hundred directories. If your article is well written, employing this outsourcing method will send a HUGE surge of traffic to your website so you must be prepared. This will not last forever because the articles do not remain on the top page all the time. Make sure that you are not too „sales pitchy? about your product or your website because some article directories are particular about the quality of the articles. They are after all, looking for quality content, not another sales letter. What better way to get your own product in front of the eyes of thousands of resellers and Internet marketers who can?t wait to sell YOUR product for their own profits (assuming that your product has resell rights to it of course). Resellers are always looking for products with a complete sales letter to it. If you have drafted out a sales letter that converts well, you can be sure that a lot of resellers will „cut-and-paste? your sales letter and your E-book and sell it to their mailing list. The most important thing for you to remember is this – your books must constantly lead the readers to your websites. Your links must be placed strategically in the E-books and as your E-books are duplicated all over the Internet, you can be sure to drive plenty of new visitors to your website – even if they are not in your circle of influence!